App Marketing 101 : How to break into the top 25 on the App Store? As an app developer, you want to acquire users efficiently by optimizing marketing spends across different channels. This becomes even more important at the time of an app launch when the lifetime value of a new user is still unknown. It's too early to determine an agreeable CPI to drive installs and thereby justify the marketing budget needed for user acquisition. Given that early users of the app are the most valuable, it is imperative that you optimize your marketing mix appropriately to maximize organic downloads. As you may have already guessed, there is indeed no silver bullet to resolve this challenge and there never will be. Appstore dynamics change every day and the right approach is somewhere in the middle. Using the right mix of paid marketing channels, social marketing, direct mailers, SEO and PR all contribute towards a successful launch. While there are a few developers such as WeChat that opted for the traditional media route to launch their app successfully, it is often an expensive and risky approach to adopt at the time of launch. For most app developers, it's advisable to test the waters first and launch the app on the big screen only after stress testing it for a few weeks! So, how should app developers measure the success of their launch marketing strategy? The most important metric is indeed the appstore rank. As an app marketer, you should measure the efficacy of each marketing channel by measuring its correlation to the appstore ranking. The efficacy of each channel can change with the category of your app (gaming, social, business etc), competition in the appstore and the timing of the launch. Needless to say, it is a continuous learning exercise for all developers and needs to be perfected over time. Install Velocity The rate of app installs is the single biggest factor that influences your rank. Apple algorithm takes into account the weighted average of the install rate over the trailing 4-7 days with the highest weightage for the last day. This is an extremely important piece of information and can be used intelligently to divide your campaign budgets. For example, whenever you run a campaign on our ad network, we would recommend that you increase your budgets just before the weekend as our network data reveals a 20%-25% jump in user engagement and downloads over this period. 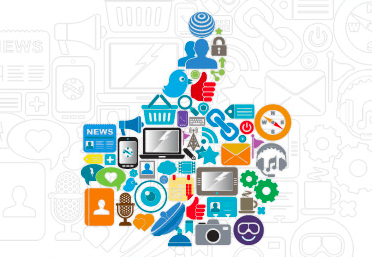 Also, pump up your social buzz and cross promotion activities around the same time. The combined effect of higher budgets, social marketing and increased user engagement snowballs to improve your rank and tends to positively impact the paid to organic ratio of downloads by two to five times. On average, across all categories, the volume needed to hit the top 25 most popular free applications is 13 times higher than the volume needed to hit the top 25 most popular paid applications. However, there are large differences per category. For example, in the weather (9x) and education (9x) categories, consumers seem to be more willing to pay for applications. The new algorithm is not only smarter but also very time sensitive which means that if all the factors don't fall into place at the time of your app launch, your rank might not be #1. Hence, the marketing mix for a launch becomes a very critical factor for the app developer. 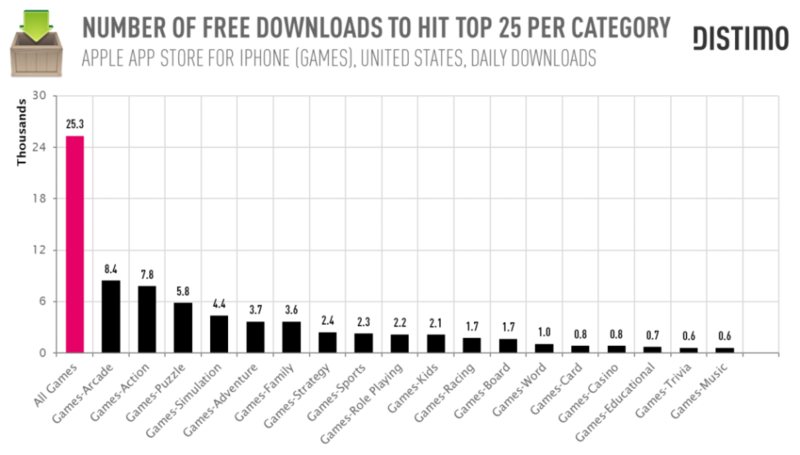 Similarly, the number of downloads needed in each market is different too. 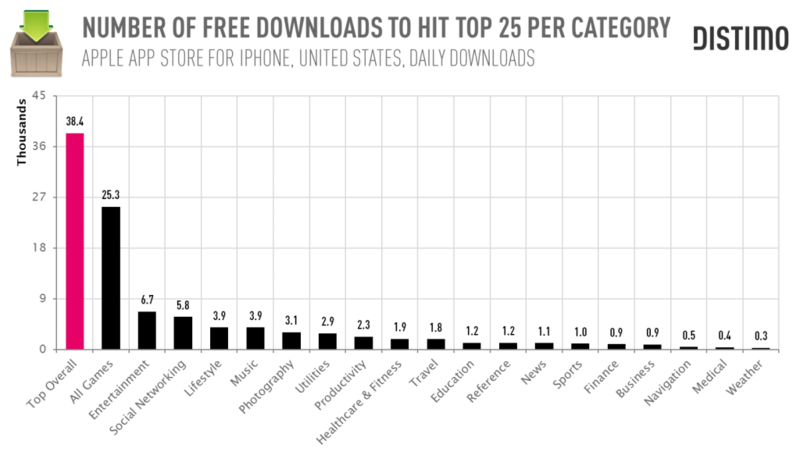 Our team of mobile experts analyzed the proportion of downloads required across markets to break into the top 25. The following is the summary of the analysis conducted among 500 popular apps across gaming, social and business segments. The uninstall rate can negatively influence your app store ranking. The uninstall rate depends on intrinsic app parameters like interface quality, app bugs etc. Ensuring that your campaign is targeted only towards quality users is also important to control the uninstall rate. Accidental and incentivized downloads are likely to hurt you more in the long run and should not be used. The App Store Algorithm also uses user ratings to gauge user sentiment. Since ratings can easily be inflated through manipulation, there is speculation in the industry that the weightage for reviews is rather small in the ranking algorithm. However, ensuring good reviews and ratings on the appstore can increase popularity and drive organic installs for your app. To collect feedback, prompt users for ratings within your app and whenever they uninstall the app. Ensure that you take the feedback very seriously and act on it to improve your chances of sustaining top ranks on the app store! Mahak Sharma is a part of the global user acquisition team at InMobi and focusses on US market. The views expressed in this blog are personal.